The judicial persecution of a prominent Indian author and essayist has riled activists around Vancouver. Many of them gathered in Surrey to protest a charge of contempt of court filed against Booker Prize-winning Delhi writer Arundhati Roy. Even as popular resistance to the FIFA-excused theft of public resources continued to grow, activists demonstrated on June 12, in Belo Horizonte, Minas Gerais State, Brazil, demanding the immediate release of the professor in India, Dr. GN Saibaba, who was abducted and arrested by the Indian fascist state on May 9. GN Saibaba is Delhi University professor of English literature, an active defender of the rights of the people and democracy. Demand the Operation Green Hunt (the war of the Indian State Against the People in India)! Freedom for all political prisoners! A large number of Palestinians now incarcerated in the Israeli prisons have begun an indefinite hunger strike since 24 April 2014 against the Zionist policy of “administrative detention” of Palestinians fighting for justice, dignity and a separate independent state for the Palestinian people. A group of 120 Palestinian political prisoners started a hunger strike and were later joined by more inmates and the strike has entered its 46th day today. This policy of administrative detention is but imprisonment without trial or charge that allows Israel to imprison Palestinians for up to six months initially and then extend it for indefinite periods of time which can go to years together. The conditions inside prisons are abysmal. According to WAFA Palestinian News & Information Agency, in the face of this hunger strike, Israeli Prison Service, in a mad rage for vengeance, has ordered prison guards to treat the inmates brutally. They have been holding prisoners on hunger-strike in solitary confinement and have also confiscated their belongings, except for their clothes, as a means of exerting pressure over them to end their strike. Thousands of French teenagers protested for the second day over the public deportation of an Albanian-Kosovar girl and an Armenian student. The issue caused disruption in 50 schools across France. Teenagers clashed with police, who used tear gas against the high-school students. 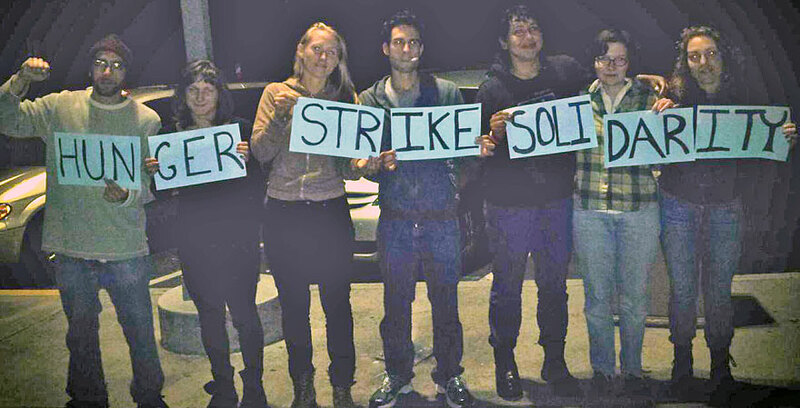 Photo of the folks who went to jail yesterday for occupying the State Building in Oakland. Taken in the wee hours of the AM, right after they got out of Santa Rita Jail.